A lot of amateur golfers struggle with making consistent quality impact. There are two main impact errors that a lot of people make; hitting the ball fat or thin. When we talk about hitting shots fat, it’s typically in reference to hitting an iron or wedge fat, but can also happen with woods as well, though less often. In this article, I’m going to address hitting the ball fat, why it happens, and how you can fix it. Let’s take a closer look at how to stop hitting golf shots fat. What is a Fat Golf Shot? First of all, what does it mean to hit a ball fat, or heavy? If I were to use that phrase with someone who isn’t a golfer, they’d probably think I was referring to a player’s weight or size, but that’s incorrect. 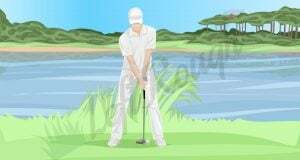 Hitting a shot fat basically means that you hit the ground before the golf ball, you hit behind the ball too far. Now, if asked how to get the ball in the air, the average player will say that you must get under the ball and hit up at it. That’s not actually true though, the proper way to hit a golf ball and get it in the air (with an iron) is to strike down on it, hitting ball first and then the ground. This creates backspin and allows the dimples in the golf ball to create lift, sort of like an airplane’s wings. That all may be a conversation for another article though. My point is, hitting the ground first and then the ball actually hinders a golf shot. One reason why fat shots happen is because people believe they need to hit under, and up at, the ball to get it to fly well. If you believe that, try erasing it from your mind. 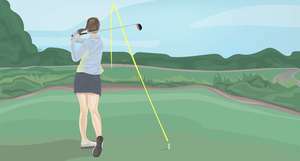 When a shot is hit fat, the club head is actually slowing down at impact because it has encountered resistance, in the form of the ground, before connecting with the golf ball. In order to hit the ball as far as possible, it only makes sense that we want the club head to be traveling as fast as possible at the moment of impact. This happens when you make impact with the ball first and then the ground. Let’s look at what causes fat shots in golf. You can think of your swing center as one of two things, either your head or your sternum. I tend to use the head reference more often because it doesn’t twist throughout the swing like the sternum does. Anyway, the head ought to stay fairly stable throughout the back swing and down swing. This allows the club to follow a, fairly, predictable path and, therefore, curing the fat shot issue. Think of your swing as a pendulum. A pendulum has a fixed point at the top, sometimes referred to as the frictionless pivot. This is the point that stays motionless while the rest of the pendulum swings back and forth. Your head is the fixed point in your pendulum golf swing. If that fixed-point stays fixed, or motionless, then the weight at the bottom of the pendulum (the club head) will always return to the same place at the bottom of the swing. So, in order for your swing to bottom out at the correct spot, and not enter the ground too early, you must keep your swing center (your head) relatively fixed like in a pendulum. Your address position ought to look fairly similar to your impact position. Now, I say “fairly similar” because it’s ok…if not encouraged…to have a slight forward movement so that you make impact with the ball first, but if you’re trying to stop hitting the ball fat, we just want to focus on keeping your head stable. The tendency, for many players, is to either sway the head backwards in the backswing, let it drop down, lift it up, or a combination of two or three of those things. 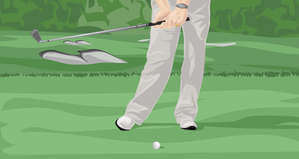 Every movement will make it more difficult for you to return the club back to a good position at impact. The reason we feel the need to move our head is because we want to get more power behind our shots. We think that if we can get more weight back and throw it through quicker, then we’ll hit the ball farther. Know that’s not always the case. In fact, most of the time, when we try to hit the ball harder, it actually goes shorter because we sacrifice centeredness of contact for swing speed. Focus first on making impact with center of the clubface and, second, on swing speed. Now that you know why fat shots happen, we need to talk about how to fix them. The simple fix is to say, keep your head still throughout your back swing and down swing. Only after impact can you let your head move. That’s always easier said than done though. One of the best players to watch do this is correctly is Ernie Els. Draw an imaginary circle around his head or just hold your mouse cursor on his head. You’ll see that it stays incredibly still throughout his entire swing. This helps him make solid impact and eliminate fat shots. When you take your practice swings, focus your attention on the movement of your head. Now, your tendency when you do this may be to tense up your neck muscles, but be sure to stay relaxed. Relaxed muscles have greater control than tense muscles. So, relax your neck and shoulder muscles. Take a few practice swings and focus on your head movement. Notice when you have the desire to tense up your neck and shoulder muscles. This will be a good indication of head movement because you’ll flex those muscles more when they are in motion. Have a friend take a video (preferably a slow-motion video if possible) of you hitting a golf ball. Then, draw a circle around your head at address. As you play back the video, watch your head. It ought to stay inside that circle until after you’ve made impact with the golf ball. If you’re able to do that, you’ll find that you limit the number of fat shots that you hit. Be sure to notice your tendency too. Like I said earlier, some people will sway their head backwards, some will dip down, and others will lift up. Whatever your tendency, try hitting your shots while doing the exact opposite. 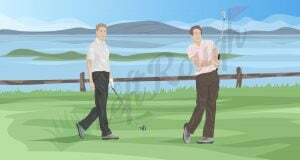 So, if you have a tendency to sway backwards, try to hit a shot where you move your head forwards instead. Since you’re so used to moving your head in one direction, this will be difficult to do and will probably result in a fairly steady head. Also, since one of the reasons we move our head, and hit fat shots, is because we want to hit the ball farther, try taking an extra club on every shot and swing easier. 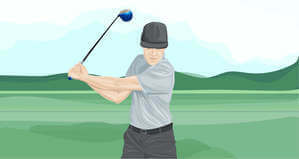 Again, a more relaxed swing and muscles will allow you to keep your head steady. 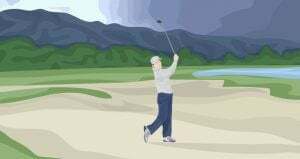 Since you already know that you have plenty of club, you will subconsciously relax and swing easier. This will naturally result in a swing that limits the unnecessary moving parts. Telling you to just keep your head still and relax won’t always fix the issue though, right? Perfecting the golf swing takes some practice. 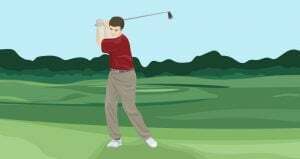 So, here are some helpful drills that you can try out to give you the feeling of keeping your head still so that you stop hitting the golf ball fat. 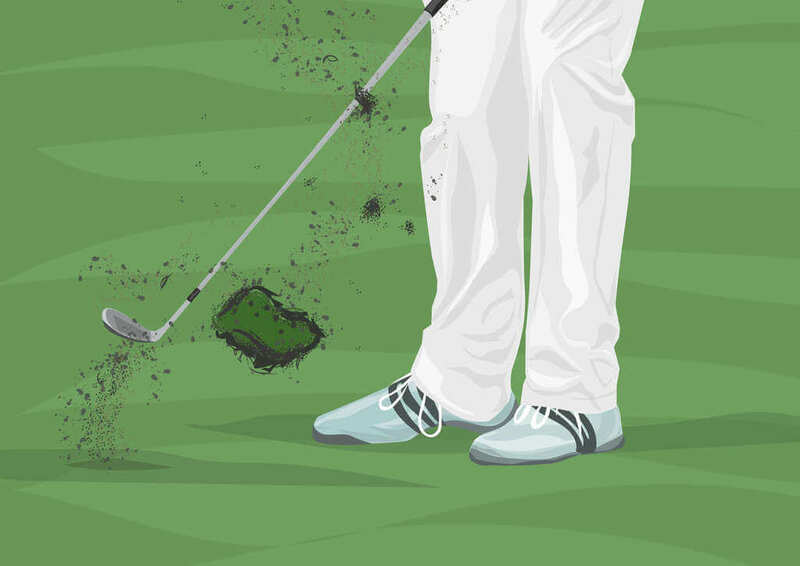 These drills will help you to stop hitting behind the golf ball. Have a friend stand in front of you, face-on. Have them take their club and rest the grip side on the top of your head. Tell them to keep it still throughout the swing, so they don’t keep it resting on your head unless your head is perfectly still. This will allow you to “feel” your head position throughout the swing. If you bump the grip more at one point, you know you’ve moved. If you feel your head disconnect from the grip, you know you’ve move there as well. Again, if you can maintain the same connection between your head and your friends grip, then you’ll notice that your shots become more and more crisp and the fat shots disappear from your arsenal. Here’s a drill you can do on your own. All you need is a book. Grab a book and balance it on your head. Try to take a few swings with the book on your head. It’ll be really difficult to do, even if you keep your head still. Obviously, the book is going to fall after you make impact, but focus on keeping it on your head as long as possible. If your head moves, the book will fall. You can even do this in your living room with an imaginary club. Take a lot of practice swings and feel the stability of your head throughout the entire golf swing. Finally, my favorite drill of all to fix a fat shot in golf to use when you are on the driving range. Take a tee and push it all the way into the ground, so you can see the top of it, but it’s not sticking up out of the ground. Then, put your ball about 1/2 inch behind it. Take a swing and focus on the top of the tee rather than the golf ball. 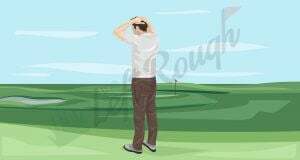 Your goal will be to “take out” the tee with your divot. This will force you to make impact with the ball first and then the ground, thus eliminating a fat shot. Since you can’t put a tee in the ground like this during your round of golf, simply focus on a blade of grass that is located in front of the ball you’re trying to hit. This will force you to bottom out in a location where you’ll make better impact and not hit behind the golf ball. Give these few drills a try because they’re the best drills available to not hit the golf ball fat with your irons and wedges. Now, I know we focused on your head quite a bit throughout this article, but it truly is the key element is making sure that your club makes solid impact with the golf ball. What happens with your head will almost directly influence whether you hit the ball fat, thin, or solid. I’m sure that if you put these ideas in to practice, and use the drills listed above, you’ll see a dramatic reduction in the number of fat shots you hit. In fact, you’ll probably see better spin, launch angle, and distance too. Now let's get to work on that big slice or all those pulled golf shots. Improve your game today! Subscribe to our newsletter to receive exclusive subscriber content and updates.